For ‘Dynamic’ in the sense of ‘defined in terms of possible sequences’, see the article dynamic definition. Dynamic characterises a position as being subject to significant future changes. A move or sequence is dynamic it it creates a dynamic position or has many, still unpredictable variations. A dynamic position has dynamic aspects and strategic concepts studying its kinds of significant future changes: development directions?, options, influence, fighting potential of groups etc. The contrast of dynamic is the quiet, currently almost settled aspects of a position, such as territory that is settled or likely will be affected only by later boundary settling during the endgame. Accordingly, positional judgement studies the non-dynamic current territory within groups with currently settled life and quiet boundaries versus the dynamic, non-territorial aspects of positions. The dynamic aspects of positional judgement are discussed in the book Positional Judgement 2 / Dynamics. 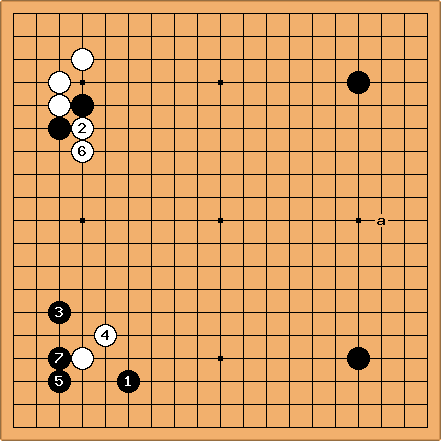 The term dynamic is also often used in A Dictionary of Modern Fuseki -- The Korean Style to describe a desireable outcome as shown in the example Dynamic Opening for Black below. Active is either a synonym for dynamic, as in active position meaning position with much dynamic aspects, or used more specialised than dynamic when referring to local or short-term dynamic aspects in a context of still being dynamic but in the process of quiescence. Bill: I don't know about , but is decidedly undynamic. Surely White a is better. See also Probing during the attach and draw back joseki.